The top reference for all study projects. From question to decision : Sphinx iQ 2, the flagship software of the Sphinx range, will assist you in all your project phases, from the simplest to the most sophisticated. Wide-ranging, it makes it possible to circulate surveys via all platforms (e-mailing, web, panels, social networks, telephone, paper), analyze data points through a quantitative and qualitative approach, and share data in real time, depending on your selected options. Sphinx iQ 2 intelligently enlightens your decisions. For fast and dynamic design of your questionnaires, Sphinx iQ 2 provides all categories of questions (closed-ended, scales, multiple, ranked, tables, open-ended, text, dates, numerical, codes…) as well as FAQs/questions libraries and many model forms that can be customized to your graphic charter. You’ll also like our questionnaire modeling system, automatic translation into over 40 languages and the possibility of embedding multimedia. The software enables multi-channel deployment of your surveys: Internet, paper, scanner, telephone, smartphone, social media and more. To spark response, you’ll be able to include video or image walls, interactive protocols or clever advanced functions: filters, send-backs, conditional displays, random feature displays, automatic question fill-ins, timed answers, and others. You’ll have access to a powerful spreadsheet program for checking data returns, with functions that allow you to control their quality and optimize them: in-put verification and qualification of files, automatic data clean-up, computation of new variables, collation, fusion… You’ll be able to adapt data harvesting to your study’s needs through a quota management system. The representative potential of your samples will be improved by weighting-coefficient sampling and rectification techniques. With 30 years of experience behind us, we’ve perfected continually-innovative statistical techniques and methods. In addition to flat and cross sorts, you’ll also gain from advanced statistical analyses to enhance your data exploitation: AFC, ACP, linear regression, PLS regression, automatic classification, typology, manova/anova, textual analyses, etc. Allowing you to benefit from this in all simplicity is our foremost talent. You’ll enjoy the benefit of clear and operational results, generated as full and customizable dash boards. 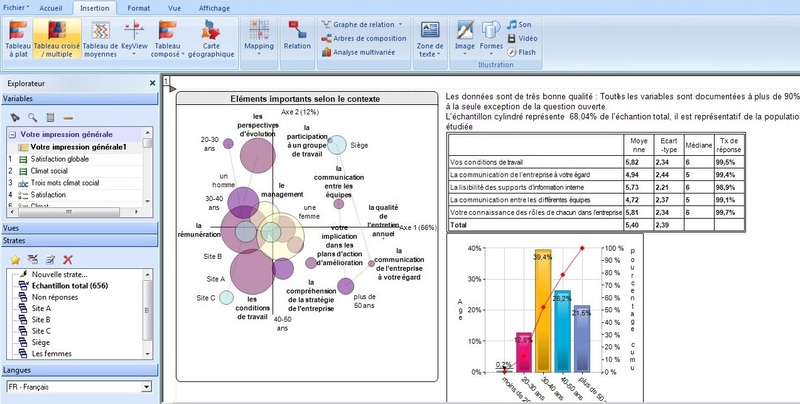 Your reports will be automatically produced and will integrate your analyses, spreadsheets and graphs, all illustrated by your own visuals and comments. The way they are presented depends on your uses: printed reports, slide-show presentations, insertion into Word/Excel files or real-time online reporting. You’ll be able to share freely with your associates so as to discuss your projects and enlighten your decisions. Opt for the Introductory training in Sphinx iQ 2 : 2 days of training to explore the main features of Sphinx iQ 2 and grow more accustomed to survey methodologies. Discover our assistance services for your survey project, benefit from the technical and methodological backing of a Sphinx research officer, for steps of your choosing. Sphinx iQ 2 ? Intelligence Quotient because our top-reference software aims at assisting you in ever more powerful and intelligent analyses of your data. Image Quality because in data processing, these initials are a pledge of the quality results which our software packages have delivered to you for 30 years.